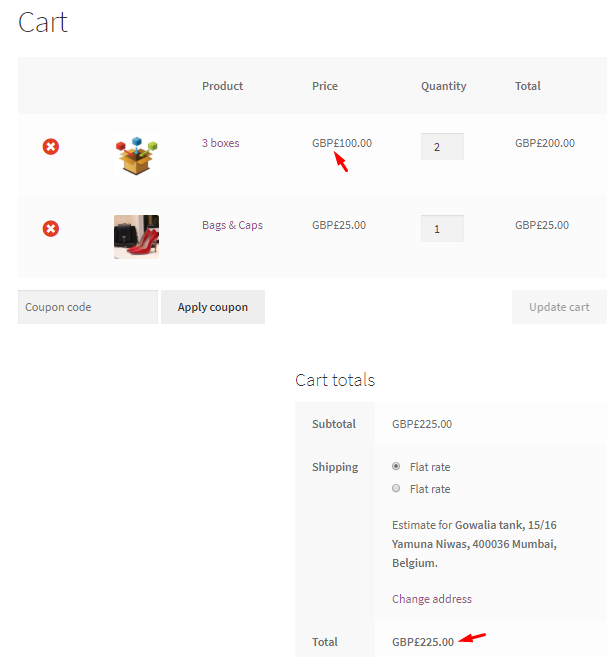 Currency per Product for WooCommerce Pro plugin allows you to set and display products in different currencies. You can setup exchange rates manually or automatically for the same and also take payments in store currency. This plugin works with all WooCommerce product types. 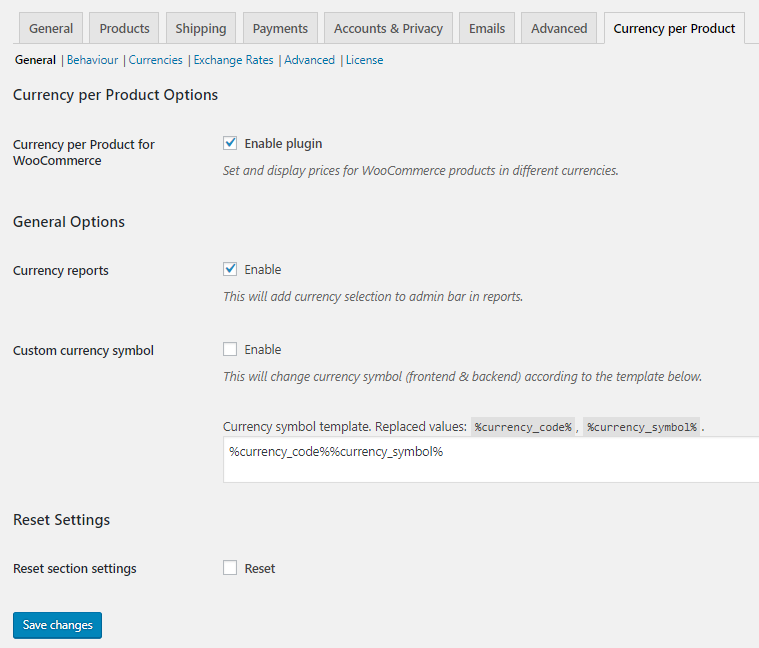 After installing the plugin, a new tab – Currency per Product gets added under WooCommerce -> Settings. There are different settings like General, Behaviour, Currencies, Exchange Rates and Advanced settings in this plugin. Let us understand the General settings in detail in this post. Let us understand each of these sections separately. 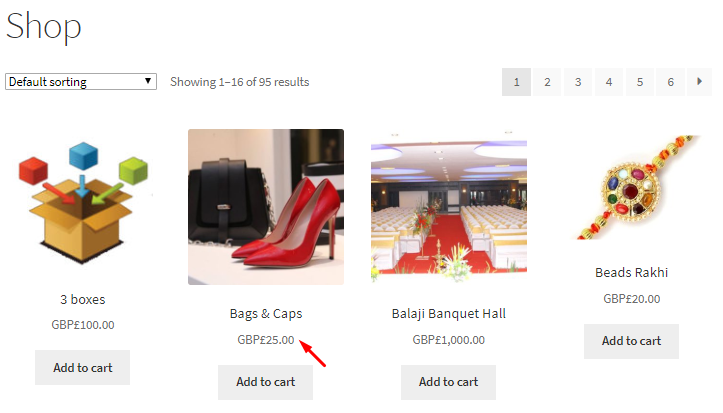 In order to set and display prices in different currencies for your WooCommerce products, you need to first enable the plugin by ticking the Enable plugin checkbox for Currency per Product for WooCommerce setting. This setting will add a new Currency per Product meta box to the Products page of all products in the backend, when you enable it. The base currency which is set globally for displaying product prices will appear under Product currency option. Therefore its showing USD by default because base currency is set to US Dollars. Product currency dropdown will display all the currencies that you have added on Currencies settings page. You can select the currency for that product from the dropdown to display it on the front end. Only after enabling this setting, other settings of this plugin will get effective for displaying products with different currencies. By default, Currency per Product for WooCommerce option is enabled. This section has 2 options, Currency reports and Custom currency symbol option. This option will add a currency selection in Reports section on Admin side. 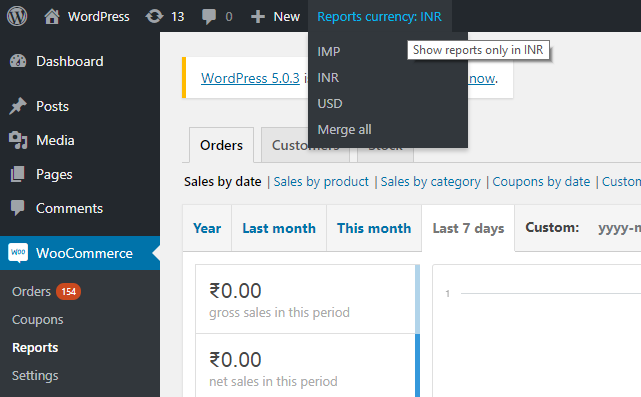 So when you go to WooCommerce -> Reports, you will find Reports currency option showing the default currency which is set in WooCommerce global settings. The default currency in this case is INR but you can change the currency by clicking on the appropriate one from the dropdown. The Reports currency dropdown shows all currencies that you have added on Currencies settings page. You can view the reports in the currency you desire, by clicking on that currency from the dropdown. If you click on Merge all option, Reports currency will change to All Currencies which means report will show result for all currencies. Let us understand report generation for selected currency, using an instance. Say you want to view report of Sales by date from 1st January, 2018 to 1st January, 2019 in US Dollars. 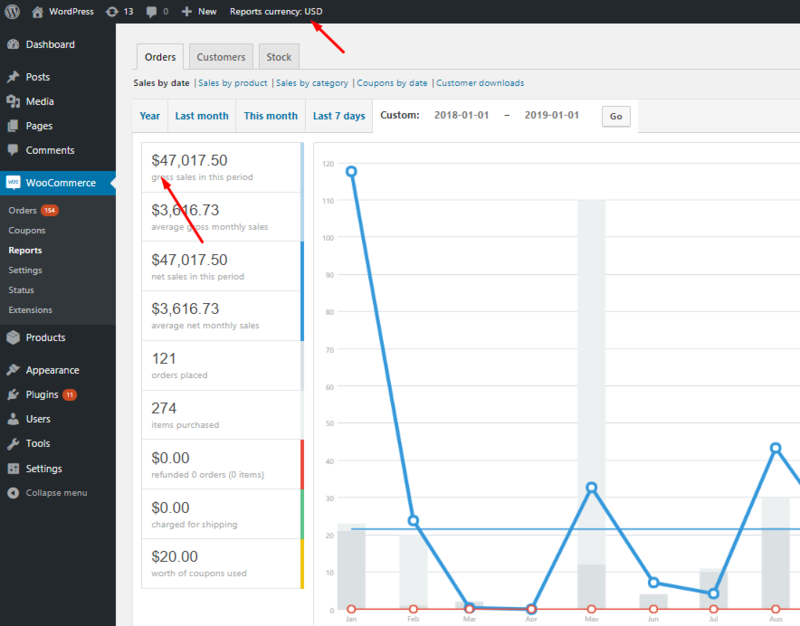 So go to WooCommerce -> Reports and click on Orders -> Sales by date and add custom dates. Then select the Reports currency as USD. This will display the sales report in USD($) for the selected dates. Currency reports setting is enabled by default. When you enable the Custom currency symbol option, it will change the currency symbol of the currency displayed for the product prices in the front end and back end. This symbol change will take place as per the Currency symbol template. You can add any template using the short codes like %currency_code%, %currency_symbol% etc. The actual values will replace these short codes while displaying the currency. Remember, the base currency will be taken into consideration for this. Let us take an instance, say you enable the Custom currency symbol and add template as %currency_code%%currency_symbol%. 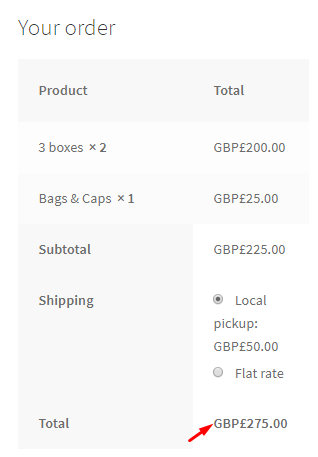 Also, set the base currency under WooCommerce settings as Pound sterling. Therefore when you go to the Admin side, you will see all the product prices are showing currency as pound sterling on the Product’s page. The price shows a currency code and currency symbol because of the template – %currency_code%%currency_symbol%. Similarly, on Edit product page, you will see the price section also shows currency as pound sterling. Whereas on the front end, this will be effective on Shop page, Cart page and Checkout page. This way actual values will replace the currency code and currency symbol of the template while displaying the product prices on the front end and back end. By default, Custom currency symbol is disabled and Currency symbol template is set to %currency_code%%currency_symbol%. The Reset settings option allows you to reset the Currency per Product Options and General Options to its default values. To enable this, tick the Reset checkbox of Reset section settings. Hence, this will tick the Enable plugin checkbox of Currency per Product for WooCommerce setting and enable the Currency reports option. Also, the Currency symbol template will display %currency_code%%currency_symbol% in the text field.